Discount available! 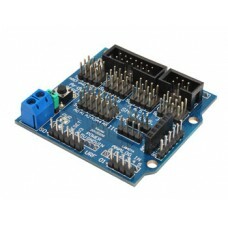 Recommend Arduino Sensor Shield to your friends and get your Discount. 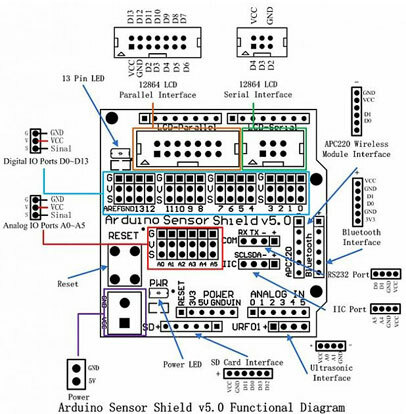 The Arduino Sensor Shield provides an easy way to connect sensors, servos, RS232 device and other modules to Arduino board. It expands Arduino’s Digital I/O and Analog Input Pins with Power and GND. It also provides separate PWM Pins which are compatible with standard servo connector. The communication socket provides an extremely easy way to plug a wireless module such as APC220 RF module and Bluetooth module. It has an individual power input for Servos. A servo power jumper allows user to select using external power or internal power to drive the Servos.